Apart from the clever application of the Issigonis-system to the Tipo 128, Fiat have incorporated some refined engineering in its detail arrangements. The overall impression of this little car, whose 80 x 55.5-mm. (1,162 c.c.) engine delivers 55 (net) Bhp at 6,000 RPM., is one of willingness, spaciousness and excellent road-clinging qualities. The performance impresses as very good, from the viewpoint of acceleration, both in top gear and through-the-box. This is confirmed by figures, which show the Fiat 128 to be quicker from rest to 50 or 60 m.p.h. than all its rivals, even those of 1,300 c.c. The Fiat 128 genuinely exceeds 85 m.p.h. and will show a satisfying 70 m.p.h.-plus in 3rd gear. It certainly more than keeps up with the traffic! 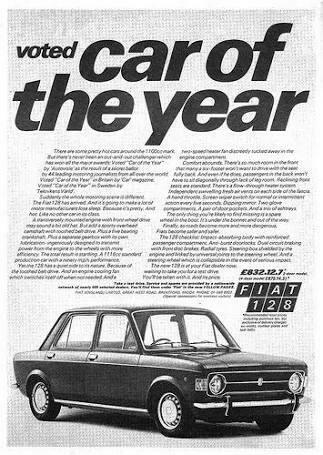 Thus, on performance alone, the 128 is a significant small car. It is also spacious without the context of an 8 ft. 4 in. wheelbase, entry and egress easy via its four doors, which possess sill internal locks and neat little pull-out handles. It is plainly but quality-trimmed and there are various amenities such as rubber-tipped bumpers, roof grabs, coat hooks, an interior lamp on each side, dual vizors, a good anti-dazzle mirror, etc. The luggage boot is wider than it is deep but a lot of luggage can be humped into it, the location of the spare wheel in the engine compartment contributing to its capacity. The front seats possess fully-reclining squabs set either by sweep or precision action from a somewhat stiff front-facing knob. I found the cushion of the driving seat rather hard on long acquaintance. Fiat do not provide an oddments' cubby-hole but there is an under-facia shelf on both sides, the driver's area obstructed by an accessible fuse-box, to which I raise no objection, for the circuit fusing is extremely efficient. There is the usual back shelf, well lipped, and tight pockets in the front doors. Arm-rests and good pull-out ash-trays are provided. On the road this Fiat handles as well as it motors. There is little evidence that it is a front-drive car, except that cruising and cornering speeds nearly coincide. It has light, quick, 3-1/4-turns lock-to-lock rack-and-pinion steering which, however, transmitted an almost alarming degree of kick-back over certain road surfaces. There is some understeer in power-on cornering and the front wheels break away early in the wet, relying on f.w.d. to pull the car straight. The brakes, disc at the front, are excellent. The central gear-lever is well placed and the changes go through quickly and smoothly, although the lever, spring-loaded to the o/s of the gate, has rather long movements. To spoil an otherwise nice gearbox, there was resistance to the selection of the 1st and 2nd gears, some pressure being needed before these went in with a "honk", which became tiring in heavy traffic. The clutch was rather sticky on the test car, and inclined to be too sudden.